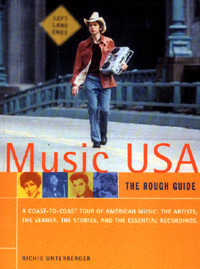 A guide to the regional popular music of the United States, published by Penguin as part of the Rough Guides' music reference series in 1999. Chapters on twenty cities and areas of the country, from New York and Louisiana to San Francisco and Hawaii, provide an overview of the evolution of all forms of twentieth-century American music, including rock, jazz, blues, country, folk, Cajun, Tex-Mex, soul, Native American, rap, zydeco, and more. Includes capsule reviews of several hundred of the most crucial recordings, and guides to the best venues and radio stations in each region, as well as to the best books and videos for further investigation. Click here for excerpts from the book; transcripts of interviews of various musicians, incorporated into feature sidebars in the book; and lists of recommended listening for various American musical genres. Music USA is part of the Rough Guides series of travel guides for the independent-minded voyager, now also including numerous music reference titles as well. All Rough Guides books are widely available at both independent booksellers and chain bookstores throughout North America and Europe, as well as many such outlets overseas. To order on-line via amazon.com, click on the book cover below.